“Richard wrote a mental diary in his head. I first found Neil Gaiman in his book Anansi Boys at an airport bookstore. This was ever-so-soon after I discovered that reading fiction as an adult didn’t mean growing up from YA books and reading Jane Austen instead. That realization also came from a book bought in an airport on an earlier trip, and it came none too quickly, finally ending a silly drought from (non-assigned) reading that characterized my first two years of college. That first airport purchase was Room, by Emma Donaghue, and it was wonderful. And it was a startling realization, really, that such a thing as fiction — that wasn’t YA, wasn’t Austen, but was still for me — existed. It was a short leap there to finding genres of literary fiction and memoirs and such. And then! Then there was the knowledge that there was nothing wrong with keeping YA in my life, nothing wrong with lots of sci fi, lots of fantasy, and even lots of so-called “chicklit” — but that I would be best to keep finding variety on my Goodreads shelves. Oh, and also that breaking and quitting not a dozen pages into an Austen novel did NOT mean that I needed to break and quit with classics as a whole. And that was How I Overcame a Reading Drought. Now back to Gaiman. Anansi Boys came just after this whole thing, just after Room, and I was smitten. I’ve read a few other Gaiman books since then, and those I’ve finished have been wonderful (The Ocean at the End of the Lane; Stardust; The Graveyard Book; a dozen or two short stories), and the one I didn’t finish, I may pick up again one day and give another try (American Gods). If anything, his books can lean dark, but they are always fantastic, always magical in the very best way. 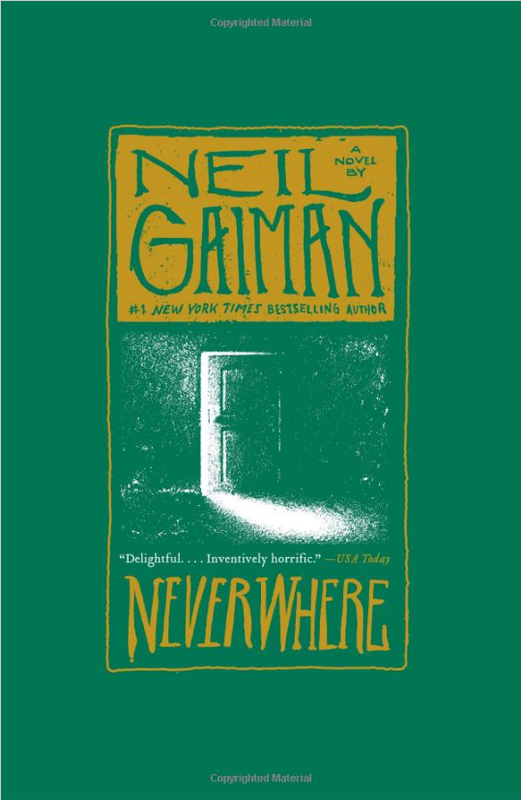 Neverwhere was one I’d had on lists for awhile. I’d had it checked out before, and never started for some reason or other (it looked a bit too long by some arbitrary standard of mine, might have been one). I’d had it on audio book, but the first chapter was, well, the entirety of my futile attempts to use audio books. Finally, I checked it out on Kindle again this January and pushed through to the end. That was the odd thing. It took pushing to get through, but I enjoyed it thoroughly each time I did. I think this may have been partially due to the beginning-of-year pressure I put myself into regarding reading goals. I kept wanting to pick up something quicker, something I could read bunches of in a sitting and mark off a list. But Neverwhere is a bit slow. Cautious, maybe. With characters and settings that need the time to explain to you quite exactly how ridiculous or threatening or fantastic they are. Underground, grimy, but fantastic, with characters I liked a good bit, and a few that I liked not very much at all, which seemed exactly how much I was supposed to like them. It was a good underground world to spend little bits and pieces of the January and a bit of February in — just not my favorite of Gaiman’s worlds.